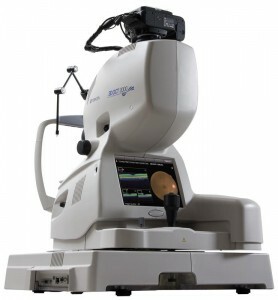 Using a state-of-the-art retinal camera, our optometrist will take a digital photograph of the back of your eye. This allow us to instantly diagnose a number of common conditions. 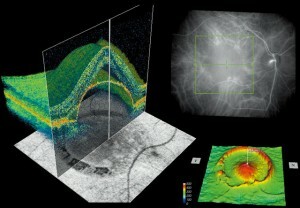 This scan is non-invasive, painless, simple and quick. What’s more, this image will be stored on our computer – so we can monitor for changes to the condition of your retina with every eye test you take. This gives you an invaluable ongoing record of the health and condition of your eyes. In addition, at our Cumnock practice we have also invested in a 3D -OCT scanner which gives the same benefits as the retinal camera, but also produces a 3D image of both the front and back of the eye, allowing even more eye conditions to be detected at an even earlier stage. Glaucoma damages the optic nerve at the point where it leaves the eye. Recent statistics suggest that some form of glaucoma affects around 2 in every 100 people over the age of 40. The danger with chronic glaucoma is that there is no pain and your eyesight will seem to be unchanged, but your vision is being damaged. Diabetic retinopathy is a major cause of visual impairment among adults. Here in the UK, more than 2 million people have been identified as having diabetes. Early detection greatly improves the success rate of treatment. A cataract is a clouding of your lens, causing your vision to become blurred. Many people over 60 have cataracts and the vast majority can be treated successfully. Macular degeneration causes the gradual breakdown of the macular (the central portion of the eye). The risk of developing macular degeneration increases with age and it is the most common cause of vision loss in individuals over the age of 50.